Is the tile on your residential or commercial swimming pool chipping? Is it unsightly, broken, or simply outdated? We can help! 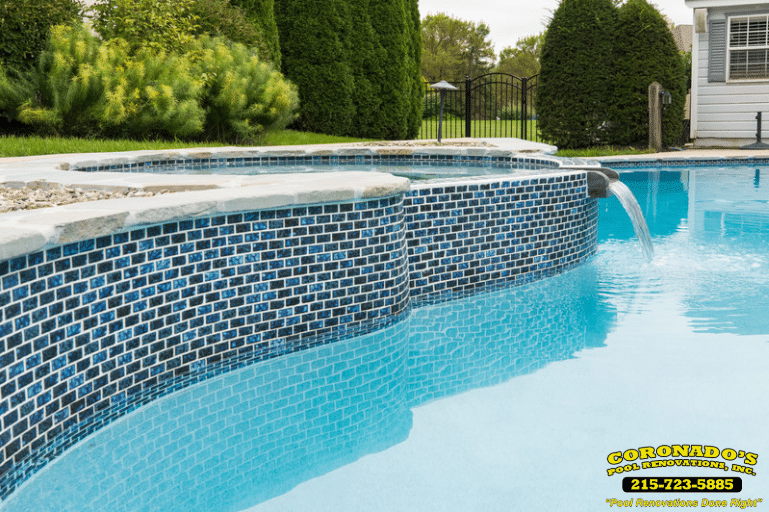 We’re a team of swimming pool tile repair experts who work with homeowners and business owners in the Bucks County area to fix the surface, tile and coping on their pools. When cracks in the tile appear, it’s a sign that more cracks are coming. Cracks in the tile of your pool are a sign that the pool is settling as it ages. As this happens, the mortar holding the tiles in place may also loosen, so some will crack or even fall off completely, leaving you with an eyesore. At Coronado’s, we can make small repairs or we can renovate the entire pool with by resurfacing and adding new tile and coping. Increase the value of your home or business. A well maintained pool is a sign of a well maintained house. When you’re selling your property, signal to potential buyers that you’ve kept the place in good shape with a flawless pool finish and coping design. Unsightly cracks and missing tiles will not help your property sell. Update the look of your pool. Perhaps you’ve renovated your home or business to look more modern, and now you need the pool to match. We’ve got dozens of options to choose from to make sure you get the exact look you’re going for for your pool. Our team of experts can help you make the right selection and take care of all of the preparation, installation and aftermath. We understand that you’re looking for someone you can trust with your pool renovations. We have over 70 5-star reviews on Google from home and business owners just like you who’ve had wonderful experiences with our work. If you’re ready to upgrade your pool in a major way, reach out to us via email at info@coronadospoolplaster.com or by phone at 215-723-5885.